Uncovering the blue-print we've been following and rebuilding foundations. I was thinking about all my clients that have come to me telling me they are “stuck” or “blocked” or they have some unknown force holding them back from doing the things they say they want. I wanted a product I could hand over to them. A freshly created blueprint with their specific directions to building their perfect lives. I’m no different. Someone claims they have the answer that will work for me and I hand over my cash. Gimme, gimme! Tell me what to do! Which way do I go around this boulder in my way? What exactly do I do and when should I do it? What I’ve realized is that this “blueprint” for life already exists. Some of you are following it right now. This “blueprint” is the advice we follow from our family even if it feels off. It is the “dream” life that is sold to us through television shows. It is taking on the belief that our friends have that life is unfair and money is tight. It is the stories we believe without question. The old ideas we hold true since childhood based on partial information or experiences that adversely affected us. This current “blueprint” we’ve been using sets up our life within limits, with fears and the judgements of others. The creative challenge this month is to discover the “blueprints” we’ve been blindly following that aren’t working. These current plans are the stories we tell ourselves. They are the things that keep us stuck circling the same carved out muddy path. These stories are the ways we question ourselves when we step off into a new direction and sabotage our new efforts. Once we clear up the foundation that our dreams are constructed on we can start making more progress. Get these underlying stories to be supporting of our dreams and away we go! What do I say I want in life ? On a scale of 1 to 10, how much do I believe I can have it? If it is low, what do I say to myself about why I can’t have it? Does this come from an old experience, hand me down beliefs or societal restraints? Write out the original source of this story. Pretend you are back in that situation and imagine rejecting, questioning or looking for a new way to look at what is happening from your new expanded perspective. Write out what you want to believe about it now. Create an affirmation that states that you have what you say you want in present tense to work with as a reframing statement, affirmation or motivational poster. When you start using imagery or painting as a way to explore deeper into your thoughts or emotions it can feel like trying to bears ride unicycles. It feels difficult and random and like your art just doesn't fit the problem at hand, but I promise it can be done. When you find the right way for you will be amazed at how you suddenly can see everything going on with you... literally. Start by answering these questions in your art and see where it takes you. 1. What color is this thought or emotion? 2. What type of mark or pressure shows how this feels to me? 3. What shape could represent my thought? 4. 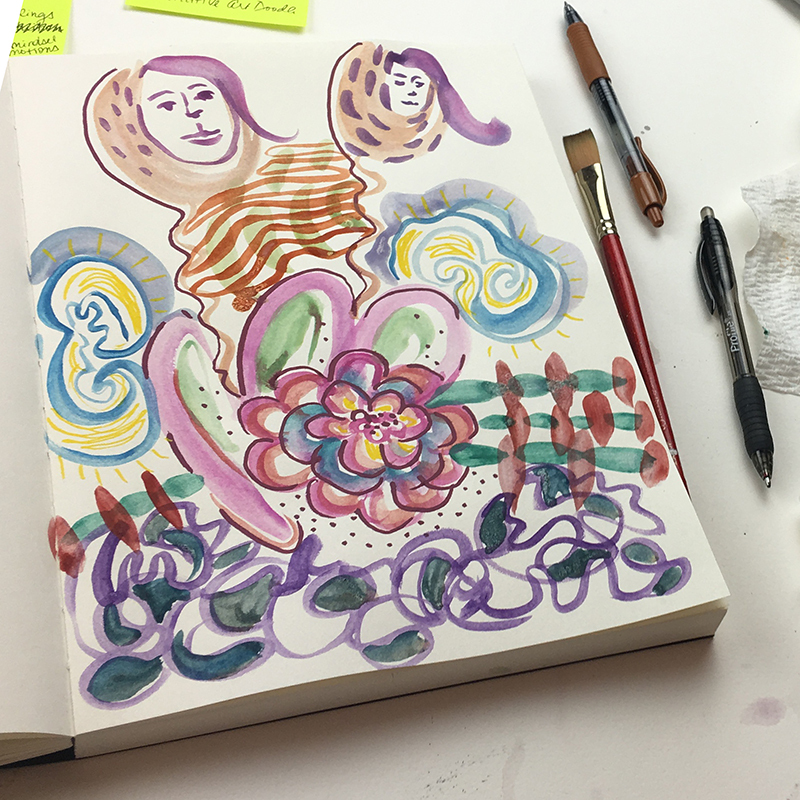 If I trusted that any doodle, pattern or idea would lead to more insight what do I feel like painting right now? Create art around the old blue print construction or belief and see what else is revealed, experiment with healing them by seeing them for what they are. Here is how I did that with my old story around my “blueprint” story that told me success is hard won and only for the highly intelligent. I’d love to see what you make. Send me an email and let me know what you tried and what it revealed for you. Finished intuitive painting on stories around success. Seems random, I actually realized what was blocking me from this page of loops of blobs. This was when I added in what stories I had about being successful... Overwhelmed, stuck in marketing and constantly stressed or busy. This was painting on the feelings of what success would feel like. Looking for more? I've put the overall process I use with clients into a do-it-yourself workbook. You can download a PDF or get a nicely printed version from this link.